It's no wonder most of the world's newest scam artists troll cyberspace for suckers. From the success of the phishers, scammers and misinformation spammers making their way up and down the information superhighway, it appears that the easiest people in the world to con are bored cybersurfers who hang out at the rest stops on the electronic information highway. In cyberland, you can be whomever you want to be. If you're 70, you can be 25, and if you're married, you can be single. If you're fat, you can be thin and if you're bald you can have a fine head of hair. And if your life is boring you can become whatever it is in your fantasy world you want to be. The cyberworld is a world without boundaries. It is as limitless as your imagination. And, because it is a world without boundaries, the opportunities for the phishers and cyberthieves are also limitless. While a new breed of cybersleuths have given credibility to the blogsphere, not everyone who calls him or herself a blogger is a cybersleuth. That's why, after over ten years of traveling back-and-forth on the information superhighway, scores of cybersurfers still think Bill Gates wants to pay people $64 thousand to test the latest version of Windows, or that they won the UK "email lottery," or that some obscure Nigerian, Chinese or Pakistani warlord wants to give them half his fortune if they will let him park his money in their checking account for a couple of days. About half of the blogsphere newshounds who run the electronic highway sniffing for the juicy tidbits of news ignored or cyberspun into a more leftist concept of reality by the mainstream media are not professional journalists who cut their teeth in America's local print media newsrooms. Most fancy themselves the new Sherlock Homes of the Internet even though most of their blog reports are extremely short on research and prodigiously long on speculation and embellishment. The latest flap to hit the Internet is a fracas that has evolved into a full-fledged cyber-donnybrook over where Sen. Barack Obama was born and if he is eligible to seek the office he's running for. In June National Review's Jim Geraghty who was praised by Daily Kos for defending Michelle Obama in the "whitey flap" she caused during the campaign, started the controversy by asking the Obama Campaign to release a copy of his birth certificate to prove that he actually was born in the United States and not Kenya as the latest cyber-rumor alleged. In an article Geraghty said: "Having done some Obama-rumor debunking that got praise from Daily Kos, perhaps the Obama Campaign could return the favor and help debunk a bunch of others with a simple step: Could they release a copy of his birth certificate? 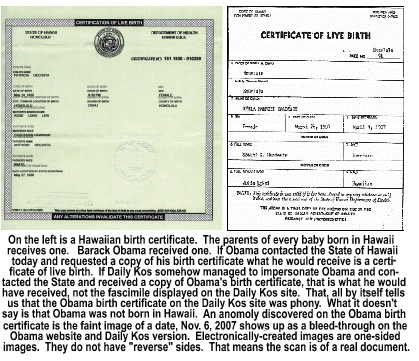 Reporters have asked for it and been denied, and the State of Hawaii does not make such records public..."
Daily Kos founder Markos Moulitsas Zuniga accommodated Geraghty on June 12 by publishing what was purported to be Obama's birth certificate. At that point the small fracas about Obama's birth evolved into a major donnybvrookfor all the wrong reasons. In defense of Zuniga (God, I hate that...) he did not say the facsimile he posted on Daily Kos as Obama's birth certificate was an electronic image of the original from the Obama Campaign. Nor did he imply that that he somehow got a copy of the original from the State of Hawaii. If the Obama Campaign transmitted an electronic image of the birth certificate it would look like the one on the Daily Kos website. However, if Zuniga managed to get a copy of Obama's birth certificate from someone within the State government, it would not look like the original, since once an original birth certificate is issued, subsequent requests for copies of birth certificates or birth records trigger an entirely different forma certificate of live birth which is an affidavit. But, let's not get ahead of ourselves. On July 8 World Net Daily also jumped into the fray with an article entitled "Obama birth certificate: real or phony baloney? Authenticity of crucial document staked on Daily Kos-drived image." This was a follow-up story to WND's June 10, 2008 headline, "Is Obama's candidacy constitutional?" That question was originally raised by National Review Geraghty's NR blog, Campaign Spot when Geraghty started the cyber-rhubard by questioning whether Obama was born in Hawaii or Kenyaor Canada. Why do people persist in complicating simple things? Geraghty, who shows his own indifference to research, shot from the hip when he wrote: "If Obama was born outside the United States, one could argue that he would not meet the legal definition of natural-born citizen...because US law at the time of his birth required his natural-born parent (his mother) to have resided in the United States for 10 years, at least [f]ive of which had to be after the age of 16." The WND article continues that Ann Durham, Obama's mother, was 18 when Obama was born "...so she wouldn't have met the requirement of five years after the age of 16." This statement, of course, implies that Dunham was not a natural-born US citizen. She was. So, let's sweep that one out of everyone's minds from the gitgo. Stanley Ann Dunham was born on Nov. 29, 1942 in Fort Leavenworth, Kansas. Her parents were Stanley Armor Dunham and Madelyn Payne Dunham. She was raised in Mercer Island, Washington. Hawaii became a State on Aug. 21, 1959. The Dunhams moved from Mercer Island to Hawaii at the end of 1960 or early in 1961. Thus, there was never a time that US citizen Stanley Ann Dunham was not a US resident until she and her second "spouse," Lolo Soetoro moved to Jakarta, Indonesia in 1967. What that means is that Barack Hussein Obama, Jr., the son of a Kenyan Muslim and a communist American atheist, is a United States citizen. Rumors initiated by bloggers like Geraghty (who are also equally indifferent to researching their suppositions before blogging them as fact) suggested that Obama won't release his birth certificate because it would prove he was born in Kenya and not Hawaii. The flap started when the communist-leaning website, Daily Kos, in response to Geraghty's demand that Obama prove he is an American citizen by releasing his birth certificate to the media, published what that website represented as the genuine birth certificate of Sen. Barack Hussein Obama. Zuniga added that Daily Kos 'trimmed" the edges of scanned image so it would not appear to be the actual size of a Hawaiian birth certificate. The problem is, Zuniga never said from where he got the document he purported as Obama's birth certificate. If he claimedwhich he didn'tthat he downloaded the imagine of Obama's original birth certificate from the Senator's website (which he did), that should have ended the flap. However, Zuniga's not admitting he downloaded the image from Obama's site left the door open for speculation. So, let's explore the speculation and cover all of the corners of this debate. 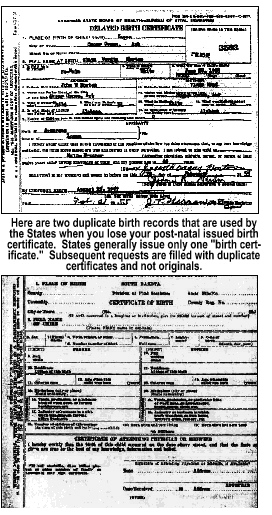 What you receive when you order a duplicate birth certificate (I know, I ordered one) is either a [a] certificate of live birth (not a duplicate of the birth certificate your mother and father received when you were born); [b] a facsimile copy of your birth recordnot a copy of the original birth certificate since the only one that was printed went to the birth parents; or [c] a stock manufactured birth certificate form containing the birth information supplied by the customer. This form, of course, has no legal standing anywhere and is not accepted as a valid birth certificate by anyone. In the case of the Obama document, a reader of my website noticed a very obscure, yet curious, date stamped on the reverse side of the document on the Daily Kos website that appears to have been missed by all of the investigators examining Obama's birth certificate. It is date-stamped "Nov. 6, 2007" on the reverse side in blue ink. A notation on the bottom of the document affirms it is a laser copy of the original. In the case of the Obama birth certificate, the date stamp proves that the Senator was given a laser proof of his original birth certificate rather than a duplicate affidavit of live birth. The date stamp, which bled through the document, also conclusively proves that the jpeg of Obama's birth certificate is an actual scanned copy of an original document since when you photoshop a document, you are dealing with a one-sided electronic imageClearly, to solve the riddle, there are only two avenues and about a half dozen riddles to solve. Either the image is genuine, or its a counterfeit. Since we know Obama claims it is his actual birth certificate, we know Daily Kos did not have to forge documents to get the image from the State of Hawaii. Zuniga downloaded it from the Obama smear website. Riddle one is solved. Daily Kos downloaded the image from the Obama "Fight the Smears" web page. The Obama Campaign posted what it claims is the Senator's actual birth certificate. That was more than enough for Geraghty who, logically, conceded the fight. Among the bloggers who followed was Pamela Geller of Atlas Shrugs (a play on Ayn Rand's classic book on human liberty, Atlas Shrugged). Om asddition, the website Israel Insider claims a blogger named Jay McKinnon , who has apparently claimed to Israel Insider that he is also a Homeland Security trained computer document specialist, purportedly also claimed he created the the Daily Kos imageand, by extension, the image the Obama Campaign claims is the genuine birth certificate of Barack Obama. Add to the donnybrook a couple of self-proclaimed cybersleuths who claim they can scientifically prove the Obama birth certificate jpeg is a forgery by the weight of the pixels. Jay McKinnon uses the email name OpenDNA and the other, whose "findings" were heralded by Pam Geller is Techdude (who could be one of about two dozen people using that cyberhandle. Techdude fancies himself as the supersleuth of the cyberworld. In proffering his "bonafides" to Geller, Techdude dubbed himself as a "...board certificated computer investigator with full access to a full forensic computer lab who has investigated thousands of cases." Note, he did not say he was "Board Certified." He said he was" board certificated" which simply means someone gave him a certificate that affirms he completed whatever course of study he purchased. I expect that someone (perhaps a blogger who calls herself "Texas Darlin'," and who publishes one of two blogs that Techdude provided with his "expert analysis" as a board certificated computer investigator, was asked to reveal his real name (so TexasDarlin' and Atlas Shrugs don't look like idiots if its revealed that Techdude really isn't a board certified forensic computer examiner who, on his own standing as a CFE, has clearance to access sensitive but unclassified DOJ information (which, by extension, implies he either has, or had, access to the DOJ building, and that he also has, or had, access to CFE experts (not receptionists) in the Treasury Department, Homeland Security and FEMA since he was ostensibly trained by them). According to TexasDarlin'and Techdude(in a July 20 post on her blog), Techdude is afraid to put his real name out in the public domain because "...some wacko decided to track [him] down and vandalize [his] car..." (slitting his tires) "...and hung a dead, mutilated rabbit from [his] front door in a lame excuse to intimidate [him] from proceeding with releasing any details of [his] analysis." Thus, the need for anonymity. According to Geller, the tire slitting and dead chicken incident happened after he released the first report to Atlas Shrugs. I found that interesting since I spent almost a week trying to learn the real identity of Techdude via the Internet (and I'm pretty good at that)., yet I couldn't learn his identity. Yet, just by the cyberhandle Techdude shared with several other bloggers and web designers around the country, Techdude would have us believe that Obama adherents found himand his address simply through the name Techdudeand vandalized his car and hung a dead chicken on his door, thus once again, the need for anonmity. Techdude claims to have testified in numerous trials in State courts, and that he wrote "winning" briefs and motions that have been presented for State Courts of Appeals and States' Supreme Court. And here I thought that lawyers wrote the legal briefs that are argued before judgesin particular State Supreme Court Justices who are usually very particular who argues the subtle points of the law before them. I'm a real fan of Judge Judy (and am probably one of only a handful of people who actually bought her DvD). She has a pet expression: "If it doesn't sound right it usually isn't." This just doesn't pass the smell test. I spent over two days searching the Internet for independent computer forensic examiners and eventually found the directory used by CFEs to advertise their "expertise," I reviewed the websites of every CFE in which the company operates in the United States or Canada, and compared their bonafides with those asserted by Techdude. It made sense to me that if I was a CFE with DOJ security clearance who had received CFE training from Treasury Dept., Homeland Security and FEMA, as well as testifying as an expert witness in State Courtsand was the author of several "trial-winning" briefs and motions, I would certainly include that in my resume under the "About" heading on my website. Techdude claims to be both a licensed private investigator and a "certificated" (not certified) legal investigator who has been working in this field as an independent contractor since 1993. (The fact that he can do pro bono work whenever he wants suggests he is self-employed since an employer would have to authorize pro bono work if he was drawing a paycheck as a CFE for one of the myriad of companies whose "Abouts" should detail the bonafides of which Techdude boasts. But none of the mind-numbing array of websites I perused did. Not one. After two days of tedious research, I was forced to conclude that Judge Judy was, once again, correct. Some people might think its bad politicking for a conservative to "shoot the messenger" when the messenger is, in all probability, also a conservative, and the target of his "investigation" is Sen. Barack Obamawhom neither of us wants to see in the White House. However, his "investigation" and, subsequently, his findings, are relevant only if he actually is what he says he is. While working six years for a former employer whom he described on Atlas Shrugs as a "...herein namless publicly traded company that designed counterfeit detection hardware and software" Techdude was more likely not the person in that company with the fraud detection credentials. One of the CFEs in the CFE Directory noted in his "About The Company" that he started as an intern and ultimately became the head of the company. That one looked promising, but offered none of the tantalizing bonafides that sent Pam Geller and TexasDarlin' into a tizzy when they referred to him as an expert in the field of computer forensics. So much for Techdude's bonafidesand Geller's excitement over the expert analyst who was debunking the Daily Kos birth certificate. In her praise of Techdude, Geller said he was an active member of the Association of Certified Fraud Examiners [ACFE], American College of Foreensic Examiners [ACFEI}, the International Society of Forensic Computer Examiners [ISFCE], International Information Systems Forensics Association [ISFA] followed by the proverbial "yadda, yadda" (meaning the bonafides continue). Since that's a mouthful, let's see what those names mean. ACFE is the nation's largest provider of anti-fraud trainingthrough correspondence courses. Businesses employ ACFE to teach their managers how to identify various forms of white collar crime and to deter fraud in the workplace. One of Techdude's former employers, which he referred to as a "...herein namless publicly traded company that designed counterfeit detection hardware and software" was more likely that not the entity with the fraud detection credentials. But, that's neither here nor there. Techdude could easily become an active member of ACFE by purchasing their Introduction to Fraud Examination (Dvd and workbook) for $229.0. He could also join ACFEI by taking an online course. Membership in the ISFCE is tough. It requires the applicant to pay $100. Absolutely no experience needed. When I was perusing scores of websites that picked up the Obama birth certificate story, Techdude's bonafides reminded me of an unconstitutional stunt pulled by a Justice Department clerk named John Edgar Hoover at the outbreak of World War I. Hoover headed up a one-man "division" in the newly formed Bureau of Investigation in 1917 called the Enemy Alien Registration Section (the predecessor to the FBI). Hoover, an opportunist of the first order, suspected that because of the large German population in the United States German spies were lurking around every corner in the nation ferreting out information to help the Motherland. Hoover saw an ad from a mail order detective agency called the American Protective League [APL]. APL was selling correspondence courses and private detective badges for $25 to bored Americans who fancied themselves as something other than...well...boring hourly workers with boring, tedious jobs. Since the Bureau of Investigation (the investigative arm of the Justice Department) only had a couple dozen field investigators, it was not equipped to handle the thousands of calls they began receiving from frightened US citizens who thought their German neighbors might be spies. Hoover convinced his boss, Assistant Attorney General John L. O'Brian that the DOJ should avail itself of free labor by officially deputizing the mail order detectives from the APL to investigate the myriad of calls flooding their office. Officially deputized as an adjunct division of the Department of Justice, the APL was given official Bureau of Investigation Auxiliary badges and turned lose to spy on their neighbors. The membership of the APL exploded from a handful to 10,000 untrained detectives almost overnight. Everyone wanted to be a Junior G-man. On Sept. 3, 1917, 25 BI agents plus 2,500 members of the quasi-official APL conducted raids in Brooklyn, New York City and Newark, NJ to roundup suspected draft dodgers (called slackers in WWI). A second raid on the Industrial Workers of the World labor union took place on Sept. 5. In all, the overzealous, completely untrained "detectives" arrested and incarcerated over 50 thousand suspected slackers. As it turned out, out of every 200 arrests, 199 were mistakes. When Congress came down on the Wilson Justice Department, the Department of War ordered the immediate induction of 15,000 of the detainees and the DOJ filed criminal draft evasion charges against another 16,000 men making it appear that only a few were questionable arrests. A congressional investigation found that less than 250 of the 50 thousand who were arrested were actually slackers. Becoming a "certified forensic computer examiner" through an online correspondence course is about as credible as being a quasi-official APL detective with the Justice Department in WWI. Sometime between June 29 and July 4, Techdude posted his "expert" opinion on the blogs of Atlas Shrugs and TexasDarlin'. After examining Hawaiian birth certificates from 2001 to 2003 and 2006, 2007 and 2008, Techdude offered his expert opinion that "...[t]he [Daily] Kos image security border pattern does not match any known specimen from any known year. It does not match the pre-2006 nor does it match the post-2006 certificate patterns. 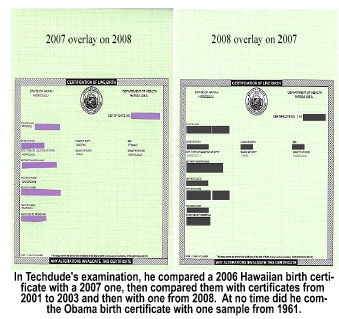 The placement of the text in all of the pre-2006 and post-2006 certificates are almost identical pixel location matches with the [Obama] image's text placement does not match any known specimen from any known year. The shape and kerning of the fonts used in the 2006 through 2008 certificate are identical while the shape and kerning of the fonts used in the [Obama] image does not match any known specimen." Techdude continues by laying out his case for the photoshopping of the Daily KOs version, which he believes was then placed on Obama's website and not visa versa. Supersleuth forgot two things. First if he wanted to compare documents to determine if the Obama birth certificate was a forgery, then he needed to examine the actual "blanks" used by the State of Hawaii in 1961 not 2001 to 2003 or 2006, 2007 or 2008. Obviously, from Techdude's own observation, the State of Hawaii made subtle changes in the Certificate of Live Birth from 2000 to 2008. Second, in 1961, certificates of live birth were typed on a traditional typewriter, not printed through a computer laser printer. If the shapes and kerning of the type fonts on the Obama document matched the shapes and kerning on the 2001 to 2008 samples then you would know the documents were forged. But, Supersleuth missed that one. For that reason we can skip the rest of the puppy poop Techdude calls evidence since the smoke and mirrors he is relying on, in his view, are the results of a heat map he did on the 2001-2003 images to gauge the jpeg compression variations. Techdude maintains that the compression values on the Daily Kos image had a different error value than the samples. Not sure what that means in "expert jargon, but I do know when you create jpegs, not all images are scanned the same. The DPi ranges are different and, if you re-scan a scan you are going to crosshatch the pixels. I'm not a computer sleuth. I barely know how to turn a computer on and, Lord help me if the computer crashes. In my opinion, Techdude lost his argument in the first six sentences of this paragraph. That only leaves the question: who is Techdude? Trying to Google an answer to that question has not been easy. I've found about two dozen Techdudesboth male and female. Since both Geller and TexasDarlin' refer to him in the masculine form, I will assume they have spoken to him and that he is a male. Most of the people using the name Techdude are either involved in web design and web hosting, computer games or solving basic IT problems. I narrowed the field down to three possibilities, but that's still two too many. So, for the present the identity of Techdude will remain a bigger mystery than Obama's birth certificate. Sadly, since Obama is a valid citizen of the United States (although he prefers to be called a "citizen of the world"), if we want to keep him out of the White House on January 20, 2009, we're going to have to vote for Sen. John McCain in November, 2008. Bummer. 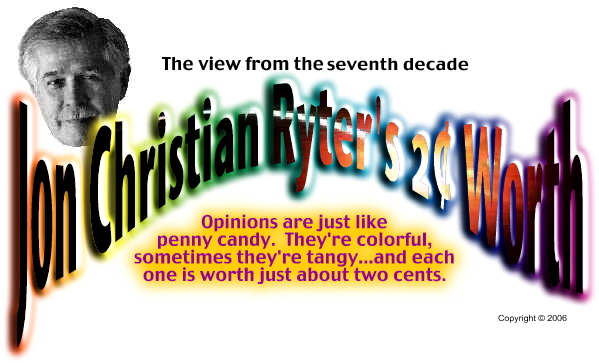 Once again, for what its worth, you have my two cents worth. And, once again, don't shoot the messenger.